On March 7, 1942, aviator “Spanky” Roberts completed his training at Tuskegee Institute in Alabama, becoming one of the first five Tuskegee Airmen. Roberts, a native of London in eastern Kanawha County, moved to Fairmont as a child. He graduated from Fairmont’s segregated Dunbar High School before earning a degree in mechanical arts from West Virginia State College (now University). He went through the college’s Civilian Pilot Training Program and became the first black licensed pilot in the state. 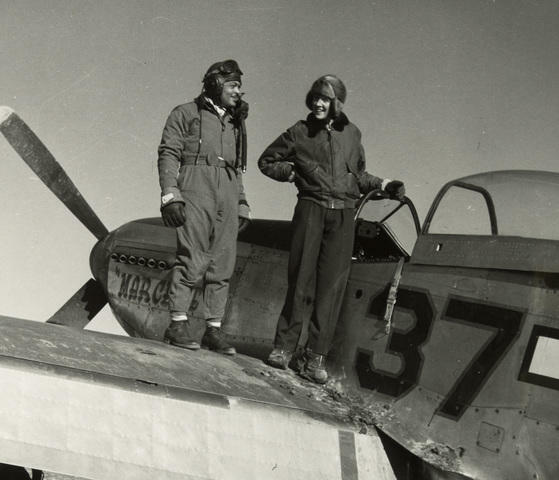 After finishing at Tuskegee, Roberts entered combat in North Africa in May 1943. He eventually flew more than 100 combat missions in Africa, Europe, and the Middle East. After the war, he became the senior Air Corps ROTC instructor at Tuskegee and also served in Korea and Okinawa. In 1963, he was assigned to Griffiss Air Force Base, where he was responsible for all ground radar in the Air Force. Roberts retired in 1968 with the rank of colonel. “Spanky” Roberts was honored with the Air Force Commendation Medal with four oak clusters and two presidential citations. He died in California in 1984 at age 65.